The town of Timbaki, seat of the municipality, is located in the west edge of the valley of Messara, 65,3km away from Iraklion. The name of the town is derived from the word "timvos" that means tomb. 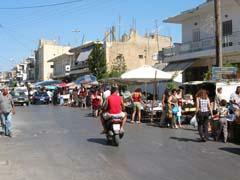 Timbaki is a busy and rich town where early garden produces, citrus fruit and olives are cultivated. The excellent weather of the area has favoured the cultivation of horticultural plants. The town provides a full range of modern facilities; banks, post office, doctors office, stores, schools, hotels, restaurants etc. to cover the needs both of the locals as well as of the hundreds of the visitors. Every Friday from 7.00 bis 13.00 a market takes place.